Whether worn purely as a fashion statement or for symbolic purposes, the powerful look of this designer men's cobalt chrome ring with Maltese crosses cannot be denied. You can trace the origins of the Maltese cross back to the 16th century. To the untrained eye, it’s a fashionable geometric shape, but this antiquated symbol has long since carried associations of truth, faith, humility, and sincerity. Each 9mm men’s cobalt chrome ring with Maltese crosses is made of a strong, scratch-resistant metal alloy that is only growing in popularity. This men’s cobalt chrome ring with Maltese crosses would make a perfect gift to anyone that celebrates spirituality and justice. The stunning Maltese cross design is set against a blackened background. Rounded edges give way to a comfort-fit band that is specially designed for men who lead busy or active lifestyles. We recommend that you have your finger professionally sized at your local jewelry store before completing your order. Comfort-fit bands typically measure a half-size smaller due to the additional metal used to create a domed profile. Looking for the ultimate accessory to take your look to the next level? 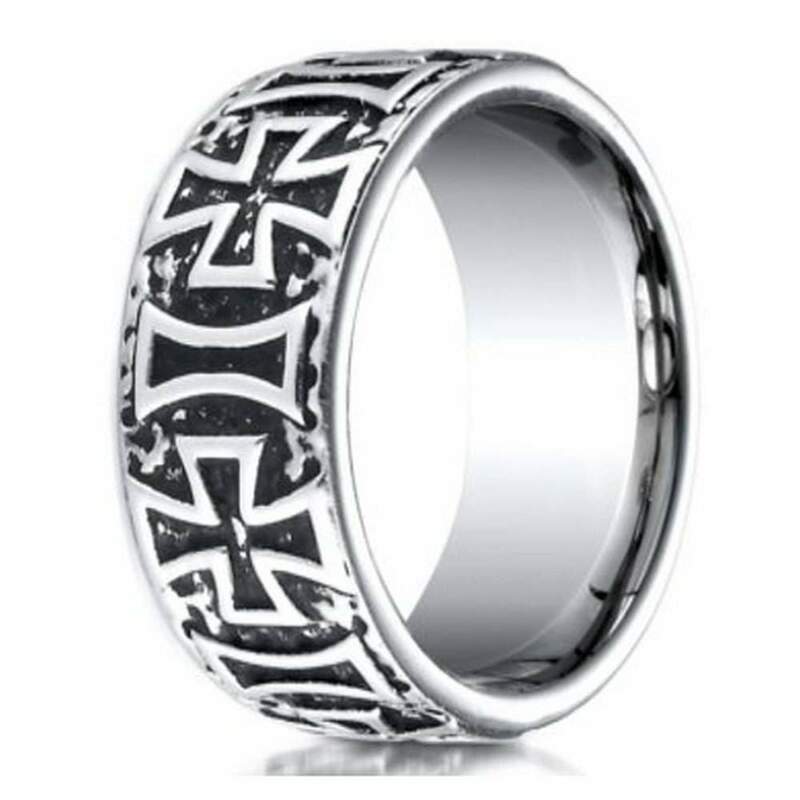 Look no further than our 9mm men’s cobalt chrome ring with Maltese crosses. This unique ring demands attention and exudes sophistication unlike anything else. If you have any questions about this product or need help finding the perfect gift for your special someone, don’t hesitate to contact us for further assistance. This is a stunning ring it has got a lot detail the picture dosen't do it justice. The size i ordered fits perfectly I have a lot of great comments from my friends about it.